The 2015/16 financial year is the third year of the 202020 Vision (20V) Program. The 20V Program is funded by the nursery industry marketing levy and is being managed by Horticulture Innovation Australia (HIA). 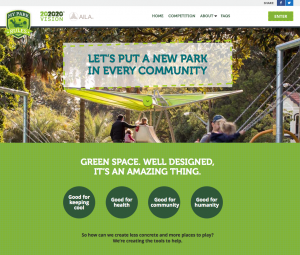 • My Park Rules is a national competition, which aims to create opportunities for every child in Australia to access the amazing benefits of a well-designed green space. • We’re on a mission to ensure every school in Australia offers quality outdoor spaces for their community. Community groups, scout halls and council-run childcare centres are also encouraged to enter. • It’s easy to enter! Schools and community groups nominate their under-loved space and tell us why it would be great for the kids and community to have it re-imagined. • A jury of experts decides the finalists in each state / territory and teams them up with a Registered Landscape Architect to help them re-imagine, design and plan the best way to use the space. So every finalist gets a tailored design for their park! Our jury will select one national winner to have their park built with the support of the My Park Rules sponsors! • Over time, we will continue to connect communities with Landscape Architects, driving the creation of more quality green spaces, and engaging our networks to make sure every school has a park that rules! My Park Rules is being run in conjunction with the Australian Institute of Landscape Architects who are making a significant contribution to the project with their partners.